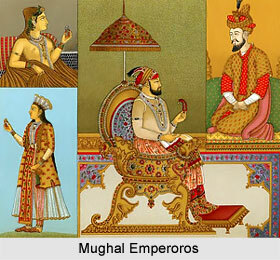 The Mughal Empire was one of the most significant Empires that ever ruled the Indian subcontinent. It is quite evident that apart from the British Empire, every aspect of our nation, whether it be art, culture, education, administration or security has been affected in some way by the Mughal influence. At its peak, the Mughal Empire included parts of Afghanistan, Pakistan and most of the Indian subcontinent. It was founded by Babur in 1526, who was a Timurid leader. He defeated Ibrahim Lodi, who was the last Sultan of the Delhi sultanate, in the first battle of Panipat. The word Mughal is a loose Persian interpretation of the word Mangol. The most prominent religion which was followed during the Mughal period was Islam. Most of the part of the Mughal Empire during Humayun was conquered by the Afghan leader Sher Shah Suri when Humayun the son of Babur was king of the Mughal Empire. But during Akbar's time, the Empire grew significantly and continue to do so until Aurangzeb’s time. Akbar's reign was followed by his son Jahangir who ruled during the period 1605 to 1627. In October 1627, Shah Jahan, son of Jahangir inherited a vast and rich empire which was considered to be the greatest empires in the world at that time. He also constructed the famous Taj Mahal between the years 1630 to 1653 at the bank of river Yamuna in Agra. The Mughals had many enemies and faced very tough competition from the Marathas. When Aurangzeb died in 1707, the Mughal Empire started to decline which made way for the rise of Maratha Empire. Still the Mughals managed to have some sort of Control for the next 150 years in India. But in 1739 they were completely defeated by Nadir Shah, a Persian leader. Ahmed Shah Abdali retook control of Delhi in 1750 with a small army but the British Empire finally put an end to the Mughal Era in 1857. In 1526, Babur invaded India while taking advantage of internal disturbances in the Delhi sultanate which was being ruled by Ibrahim Lodi at that time. He received significant help from the governor of Punjab, Daulat Khan Lodi and also Alam Khan who was the uncle of Ibrahim Lodi. Babar belong to a Royal Mongol family. He was the great grandson of Mongol ruler named the Taimur Lenk who had first invaded India in the year 1398 before he retired to Samarkand. During the 16th century, different Muslim armies which consisted of Mongol, the Uzbecks and Mongol soldiers attacked India under the leadership of the Timurid Prince Zaheer Ud-din Muhammad Babar. Babar was exiled from Samarkand by the Uzbeks when he fled to Kabul in the year 1504. He grew his military power in Kabul itself and finally invaded India in the year 1526 as an experienced military leader with a well-trained army of 12000 soldiers. But he was to face the colossal army of 100000 men led by Ibrahim Lodi. He still managed to defeat the Sultan in a decisive manner at the first battle of Panipat by using gun carts, artillery and his infamous cavalry tactics. In the year 1527, at the battle of Khanwa he again defeated the Rajput confederation, led by Rana Sanga of Chittoor. Third major battle which was fought by Babur in his lifetime was in the year 1529 in which he fought the combined forces of the Nawabs and Sultan of Bengal in the battle of Gogra. He died at Agra in the year 1530 before he could consolidate his military conquests and achieve his dream of a consolidated Empire in the Indian subcontinent. Humayun inherited the throne in the year 1530 but under very difficult circumstances. He was facing aggression from all possible sides including the Afghan claims to the throne of Delhi and disputes over his own succession. But after Sher Shah's death in May 1545, Humayun, after having gained quite a following in Kabul with the assistance from Safavid came back to Delhi and took control of the Sultanate in the year 1555. He died only 6 months later because of falling down from the steps of his library. After Humayun’s sudden death in 1556, his 13 year old son Akbar was left with the huge task of consolidating the Mughal Empire. When Akbar came of age, he freed himself from the influences of Bairam Khan who had previously and successfully expanded the Mughal Empire on Akbar's behalf. He proved his leadership and judgement skills to the overbearing ministers. He became a workaholic who rarely slept more than 3 hours a night and personally monitored that his policies were implemented. These policies remained the backbone of the Mughal Empire for more than 200 years. Akbar built his capital at Fatehpur Sikri near Agra in 1571. He adopted very varied policies when it came to administering a large territory and an area with a diverse ethnic community. Apart from administration and expansion of his vast Empire, Akbar also paid enough attention to the Empire’s economic status. In the year 1580, he asked for the revenue statistics of the past 10 years so that he could understand better the details of fluctuations in the price of different crops. He was assisted by Todar Mal, who was a Hindu scholar and hence released a revenue schedule which was in favour of the peasants and also considered the need of the Empire. During the end of Akbar's reign the Mughal Empire had already extended throughout the Northern India even up to the southern area of Narmada River. Some exceptions included Gondwana in the central India which paid taxes to the Mughals, Assam in the Northeast and significant part of the Deccan. When compared with the British Empire, in 1600, the net revenues of the Mughal Empire were 17.5 million pounds whereas in the year 1800, the entire treasury of the British only totalled up to 16 million pounds. The notable points of the Mughal Empire during the rule of Jahangir and Shah Jahan were the political stability, growing economic activity, promotion of art and architecture etc. Jahangir was married to a Persian princess who was renamed as Noor Jahan which meant ‘light of the world’. Noor Jahan became the most powerful member of Jahangir’s Court. Therefore, Persian poets, artists and other officers which included members of her own family found their habitat in India. Corruption began to decline and unproductive officials were weeded out but due to the inclusion of Persian representatives the delicate balance of impartiality at Jahangir’s court was shaken. As far as religion is concerned, Jahangir liked the Hindu festivals but he promoted Islam extensively and also persecuted Jains. He even executed Guru Arjun Dev who was the fifth Sikh guru in the year 1606 because the Guru refused to make changes to the Guru Granth Sahib. In the year 1622, with the support of Noor Jahan, his son Shah Jahan rebelled against Jahangir. Taking advantage of the situation, the Persians conquered Kandahar in the southern parts of Afghanistan which struck a very significant blow to the Mughal Prestige. During the year 1636 to 1646, Shahjahan sent different convoys to the southern parts of India and to the North Western parts of the Mughal Empire beyond the Khyber Pass. This put a very significant toll on the empire’ss treasury. Shahjahan also built Taj Mahal in Agra as a tomb for his beloved wife Mumtaz Mahal which symbolised the beauty of Mughal architecture and huge expenditures at a time when the economy was shrinking. Aurangzeb was the last of the great Mughal emperors who ruled for over 50 years. During his reign, the Mughal Empire achieved its biggest physical size but had also started to show signs of decline. The Emperor's Court was corrupt and the army was outdated with weapons and tactics. Although Aurangzeb restored Supremacy and dominance to the army, but it was short lived as he was engaged in wars against the Pathans in Afghanistan, the Sultan of Bijapur, Golconda in the Deccan, Marathas in Maharashtra and Ahoms in Assam. Revolts by the farmers and the local leaders were pretty common in his reign which was weakening the Mughal Empire from within. The increasing Association of the Mughal Empire with Islam also put a wedge between Aurangzeb and the Hindu community. There was a lot of competition for the throne of Delhi and after Aurangzeb’s death, there was not a single significant successor who had managed to keep everyone at bay for longer periods of time. Regional Nawabs and governors were breaking away from the empire to establish their own kingdoms. The Marathas were constantly giving the Mughals a big trouble and after 27 years of war from 1680 to 1707, the Mughals finally lost and had to make peace with the Maratha Army.